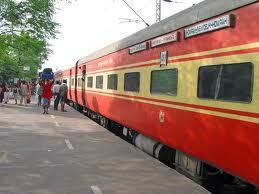 Rajdhani Express is a fully air condition and luxury super-fast train of Indian Railways network. Travelling in Rajadhani Express provides exclusive chance of experiencing Indian tourist destination with Indian Railways. Every essential facility has been provided inside the train to provide you a comfortable journey. New Delhi : New Delhi is the capital of India and modern metropolitan city. New Delhi is connected to all the major cities of India by Rajdhani express. The tourist places of Delhi are Old Delhi, Chandni Chowk, Red Fort, Jama Masjid, India Gate, President house, Old Fort, Humayun's Tomb, Qutb Minar and Tughlakabad Fort etc. Kolkata : Kolkata is situated across the banks of river Hoogly and also known as gateway city of eastern India. Even with its huge population, Kolkata is a very wonderful city with distinctive attractions. The tourist places of Kolkata are Fort William, Victoria Memorial, St.Paul's Cathedral and the Raj Bhawan. The place where holy river Ganga meets the Sea known as Diamond Harbour, is 51 kilometres from Kolkata. Chennai : Chennai is a modern metropolitan city of South India and the capital city of Tamilnadu state of India. The main tourist places of Chennai are Kapaleeswarar Temple, Parthasarathy Temple, Fort St.George, St.Mary's Church, San Thome Basilica, Government Museum and Valluvar Kottam. Marina Beach’s broad sandy shore is the ideal place for an evening stroll. Mumbai : Mumbai is the commercial capital of India and a well developed metro city. The main attractions of Mumbai are Gateway of India, Marine Drive, Mahalakshmi Temple, Afghan Church, Hutama Chowk, Nehru Planetarium, Victoria Terminus and Elephanta caves. Hyderabad : Hyderabad is the capital Andhra Pradesh, and more than 400 year old city of India. Hyderabad is famous of its pearls, stunning monuments, language, food, traditions and good manners. Main attractions of Hyderabad are Char Minar, Golconda Fort, Mecca Masjid, Birla Temple and Pubic Gardens. Bangalore : Bengaluru is a modern and very fast growing metro city of India and also known as the Silicon valley of India. The main destinations of Bengaluru are Tipu Sultan's Fort, Bangalore Palace, Lal Bagh Gardens, Cubbon Park, Ulsoor Lake, Bull Temple and Venkatappa Art Gallery. Bhubaneshwar : Bhubaneshwar is the capital city of Orissa state of India and also known as Temple city of India. Some of the famous Indian tourist destination like Puri and Konarak are close to Bhubaneshwar.